Handloom is one of the largest economic activities, considered by many to be the second largest community of working individuals in rural India, providing direct employment to over 65 lakh families, but it is fast losing its importance. Access Livelihoods Consulting (ALC) India, a Hyderabad-based social enterprise established in 2005 to work with weavers and other economically marginalised communities, is our field partner in Andhra Pradesh and Telangana. They believe in improving the income of the weavers by giving them a major share in the collective income of the weaver’s company. 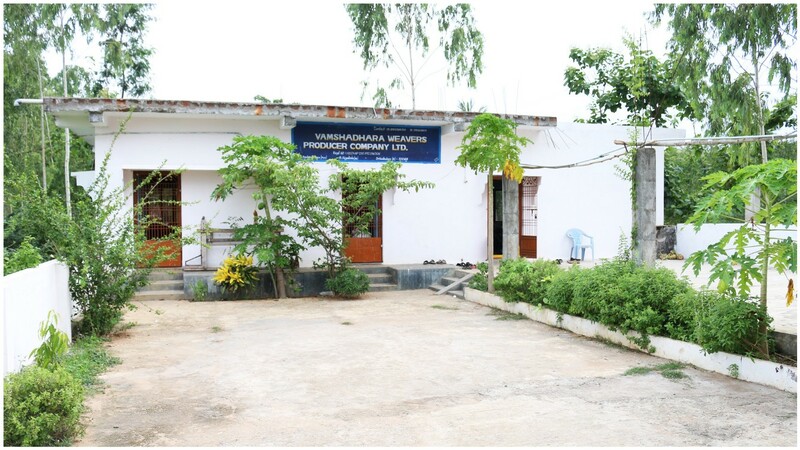 Godavari Women Weavers Services Producer Company (GWWSPC) was formed two years ago in Mandapeta, East Godavari in Andhra Pradesh and it now consists of more than 300 women weavers who earn a good income through this producer company. GWWSPC is the first Indian producer company owned and managed by the women weavers themselves. Before the formation of GWWSPC, a majority of weavers used to work for master weavers or for themselves. Presently, local weavers are provided consumption loans and advances which render them completely indebted to the master weaver. While working under a master weaver, the expenses of cloth, yarn, dye and other raw materials were usually borne by the weaver. These weavers were not financially stable but as they are desperate to earn money, they took loans at high interest rates to acquire raw materials. On completion, the finished products are given to the master weaver who, in turn, gives them a very low income driving them further into debt. To enable the weavers to increase their income and have a sustainable livelihood, GWWSPC in Mandapeta. ALC provides the weavers raw materials such as dye, yarn, cloth etc. They do not compromise on the quality of raw materials so weavers produce high quality finished products. This gives them a chance of earning a higher proportion of the rupee paid by the consumer. The weavers are given daily wages based on how long it takes them to finish the product. In GWWSPC, the weavers can get help from their family in finishing the product but the wages will be given to the women weaver. These weavers, already skilled in the art of weaving, are provided additional skill training in areas like design. ALC India provides sales and marketing support to the producer company, enabling the weavers to reach the market directly. ALC has sought the help of Rang De as we can provide the weavers with assured loans as traditional financial institutions are not too keen on extending loans to producer companies and money lenders charge very high interest rates robbing the weavers of the little income they earn. GWWSPC has many goals for the next five years — they plan to increase the membership to 3000 weavers, seek to establish 10 production centres, hope to achieve sales of Rs 72 crores, produce 60 lakh metres of cloth and increase the income of the weaver by 80%. These goals can only be met when they get all the help they need at this crucial stage in the early years of the company. This post was written by Aaron Sarojkar, one of 17 students selected in the May-July Rang De Online Content Writing Internship Programme. Aaron hails from Warangal and currently studies at Kakatiya University.